Saturday March 11th 1893 I depended on Josie to do the most of the work and I sewed all day on my dress. I got it nearly done. I cut carpet rags in the evening. Sunday March 12th 1893 Josie went to church and I devoted the whole forenoon to the work. Will and I walked over to town after dinner. I read and wrote in the evening. 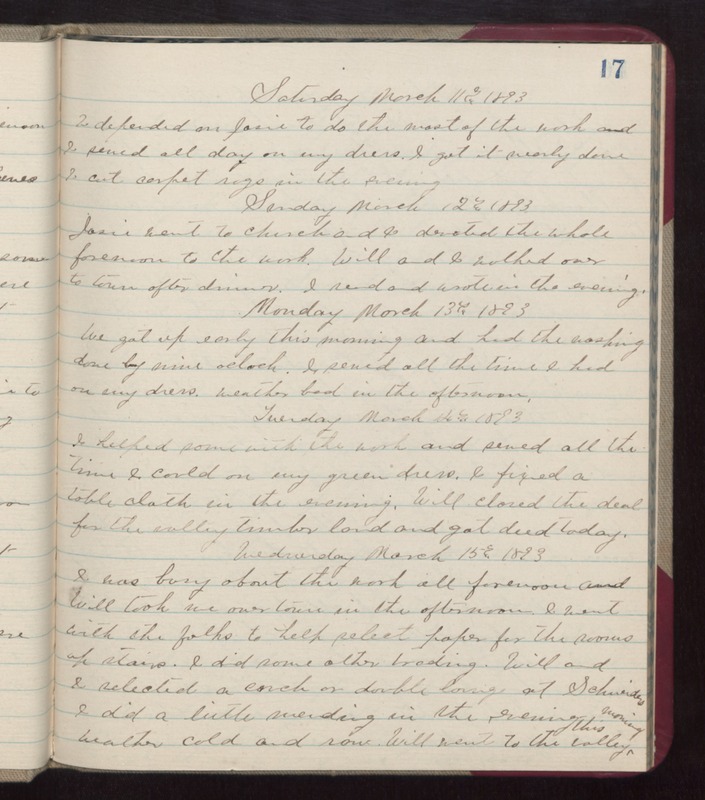 Monday March 13th 1893 We got up early this morning and had the washing done by nine oclock. I sewed all the time I had on my dress. weather bad in the afternoon. Tuesday March 14th 1893 I helped some with the work and sewed all the time I could on my green dress. I fixed a table cloth in the evening. Will closed the deal for the valley timber land and got deed today. Wednesday March 15th 1893 I was busy about the work all forenoon and \Will took me over town in the afternoon. I went with the folks to help select paper for the rooms up stairs. I did some other trading. Will and I selected a couch or double lounge at Schneiders. I did a little mending in the evening. Weather cold and raw. Will went to the valley this morning.